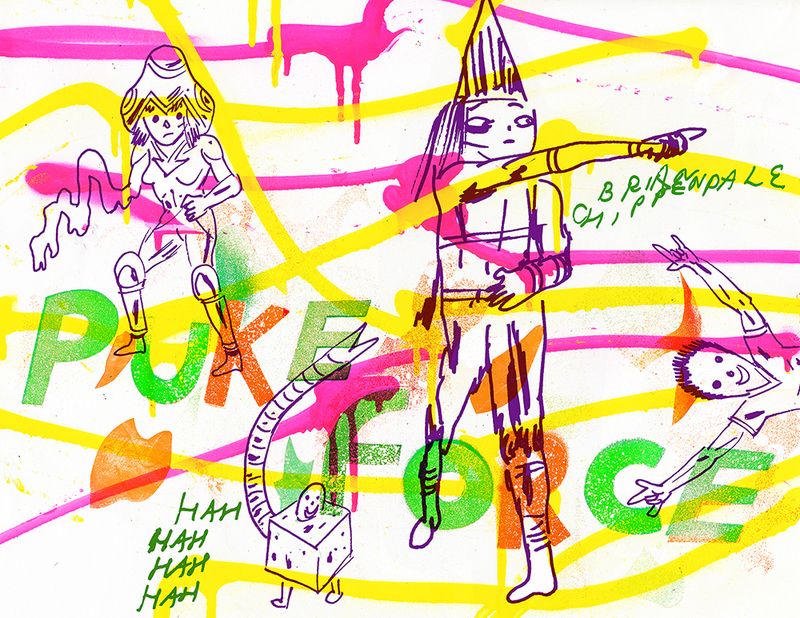 The first thing you should know about Puke Force, a compilation of Brian Chippendale’s webcomics, is that the cartoonist also comprises half of Lightning Bolt, a fuzzy, processed noise rock group from Providence, Rhode Island, known for experimenting with form. He also played drums on Björk’s Volta album. The second thing you should know is that nearly every page of this graphic novel contains a miniature diagram at the top explaining the order you should read the panels. The directions mostly instruct reading in a snakelike fashion, following the first line left to right, the second right to left, the third left to right, and so on. But there are exceptions. This decision is weird and offputting and aggravating, in much the same way as Lightning Bolt’s music, which could seem like an extended attempt to irritate you into a new state of consciousness. 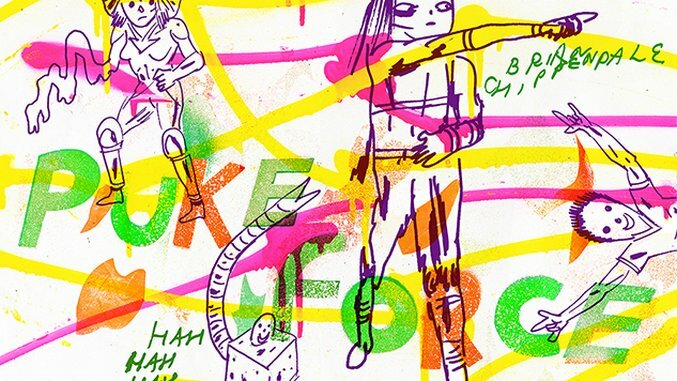 Even if you dive into the book without knowing any of this, however, Puke Force is strong enough in its own right to captivate your attention and stimulate your brain. The tug of war between enjoyment and provocation is harder to play than it may seem. Many artists working in the avant-garde realm of comics can push the annoyance factor too far, failing to dole out rewards often enough to make the reader stick with it. They may not be all that interested in narrative, focusing instead on pure visual composition. Their stuff is frequently gorgeous, and yet there’s almost no motivation for one to progress to the next page. Chippendale may initially seem like one of these creators, but he’s not. That decision to snake the panels (probably) started as a lark, but it makes his comics read more slowly and carefully than if they followed a more traditional format. His pages are packed with jokes. Sometimes they’re a mess—the art is pure horror vacui. Every inch has something on it, which, combined with the intentionally amateurish drawing, can make Puke Force resemble a middle school notebook. But as you read—slowly, annoyed, wondering if you’ll grasp what in the hell Chippendale’s getting at—bigger themes emerge. The cartoonist has things to say about Internet culture and its influence on original thought, about the way we think about terrorism, about lack of ambition and whether or not we should be attempting to change the way things are. The fact that he buries these thoughtful meditations in jokes and intricate, weird drawings makes them much stronger than your standard outrage-based Internet long read, because they clearly spring from the mind of a person who isn’t very interested in your clicks or whether or not you agree with him. 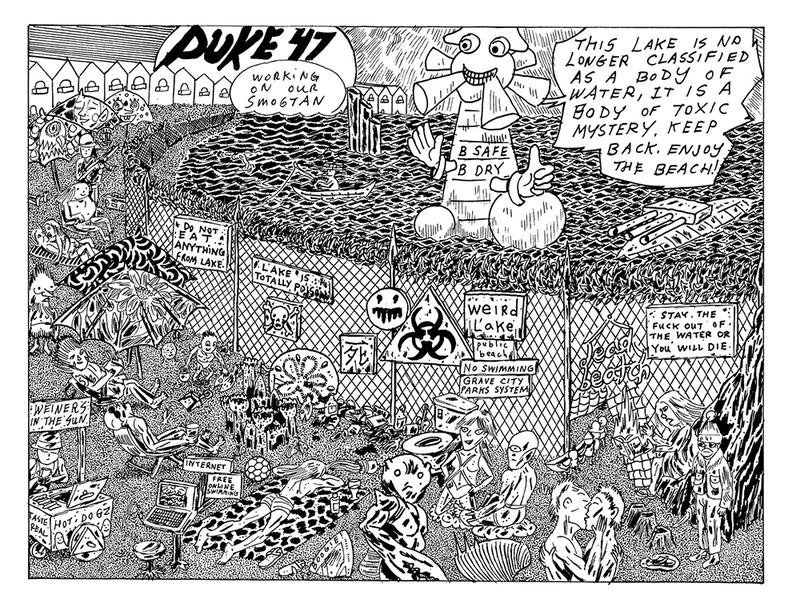 Puke Force is in no way perfect, but it is a fantastic and aggressive vomiting of contemporary culture that is both compelling and valuable.